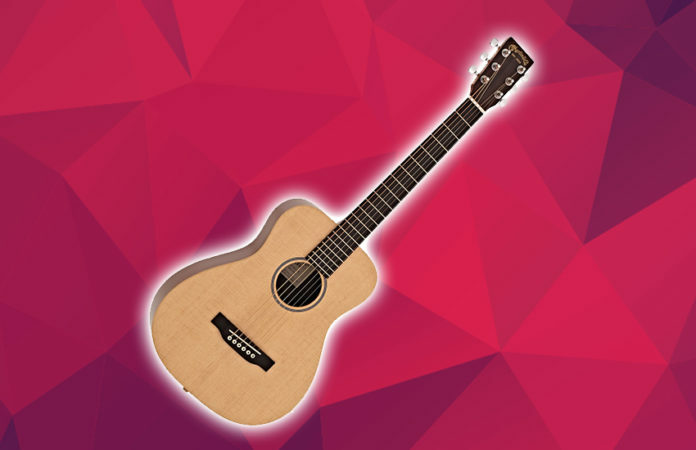 Similar to the Martin LXM, the Martin LX1E is also a popular acoustic guitar for travelers. I will try to be as honest as possible in this review. Martin guitars usually get praised a lot for how good they are, but I think that the LX1E isn’t one of them. Don’t get me wrong, for the price you pay, you definitely get good value, but I still think that Martin could have done better when it comes to playability and sound. 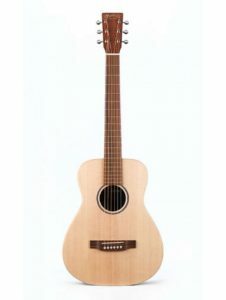 As I mentioned in the beginning, this guitar can be categorized as a travel guitar, because it’s smaller than almost all of the Martin guitars available, and it is very easy to carry around. Since it’s small, it can also be a great option for kids and people with smaller hands also. The downside of the small guitars is that they usually aren’t as good as the full-sized dreadnoughts when it comes to volume. However, with this product, Martin tried their best to get as close as possible to the volume that a full-sized dreadnought is able to output, and they did a good job with that. The LX1E isn’t the best small guitar that Martin has made, but it isn’t the worst also. It’s somewhere in the middle of their huge line of acoustic guitars. The Martin LX1E has a Solid Sitka Spruce top, which is the reason why this guitar has a bright sound. The Back & sides of this guitar are made of high-pressure laminate (HPL), which is popular among small guitars that Martin makes. It has a TUSQ saddle & nut, which is an imitation of bone. TUSQ saddles & nuts have gained popularity over time because they are cheaper and have almost the same quality when compared to the bone saddles & nuts. No complaints here. If you have large hands, I would say that this guitar won’t be suitable for you. This is because the higher frets will be harder to play. Don’t get me wrong, this doesn’t mean that its a bad thing. I am just saying that it’s easier for people with smaller hands to reach them when compared to people with large hands. If you have large hands, you will have to concentrate a bit more to reach the frets and play them correctly, otherwise, you will be fine. I personally am a huge fan of Martin acoustic guitars, but this one just didn’t do it for me. I was so excited to play it and see what it has to offer for us, but that changed as soon as i picked it up. It just wasn’t the correct option for me. 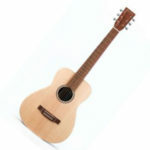 If you have a child, or you have smaller hands, you might feel different about this guitar. If you were looking for a travel guitar and you have bigger hands, there are some better and cheaper models available which you should look at. To conclude, i would say only buy this guitar if you have small hands or you just want a small guitar that you can take with you wherever you go. The Martin LX1E is not ‘main guitar’ worthy.